So, the chances are that you've heard of brine pools, which form when methane erupting from the seabed expose ancient salt deposits - the concentrated salt mixes with the water and forms brine, which, being heavier than water, forms large pools in the deep sea. Could some kind of sessile organism evolve to feed solely on victims of toxic shock? Primarily, what kind of anatomy or body plan would be suited to doing this? Would excess salt from the embalmed corpses need to be expelled somehow, like marine iguanas do? The concentrated brine is one problem. But some organisms do fine with that - hagfish can live in brine pools and they are actually messed up if salt levels get too low. 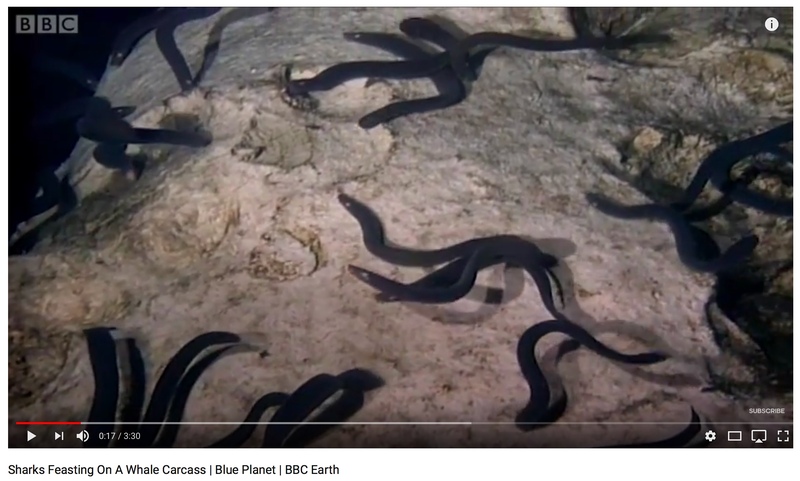 As seen in above youtube capture (of a whale fall, not a brine seep), hagfish are already the scavenging cleanup crew of the deep ocean and presumably carry out that function around the brine seeps where they live. But there is another problem with those brine seeps - hydrogen sulphide. I suspect the weird acting and moribund fish captured by in the youtube brine seep videos are actually intoxicated by H2S. H2S is poisonous to oxygen breathers and that includes hagfish. How do they cope? I don't know how the hagfish do it. If someone does please post in comments or add link! Hagfish are weird and ancient and not much known. But maybe an animal could deal with H2S if it had commensal H2S oxidizers? Within their tissues, certain clams and worms host bacteria capable of oxidizing H2S. So there is my answer. Hagfish, and if you want a super hagfish, give it a resident population of H2S oxidizers in its gills. Which I would bet a buck they already have. Before tardigrades became the mascot for indestructible critters who can survive in outer space, there were brine shrimp. Brine shrimp went to the moon. They can survive dehydration, and extreme temperatures over water's boiling point and approaching absolute zero. 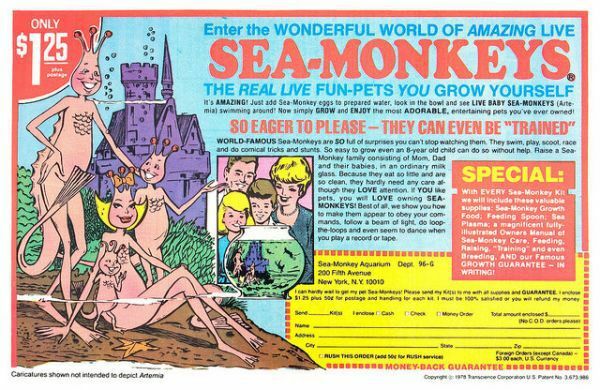 In the 1990s brine shrimp cysts supposedly carbon-dated to 10,000 years old were revived, and in the era of processed foods and instant coffee, brine shrimp became the "instant pet", marketed as Sea Monkeys®. Just add water! They are essentially unchanged since the Triassic era, and they sound like something HP Lovecraft would write about. The immature have 1 eye, the adults have 3. Their limbs aren't controlled by their brains, but by local ganglia which can decide to detach a body part to confuse predators. The females can give "live birth" or create egg-cysts that can be dormant for 25yrs (or 10,000 if you believe the claim from the link). They reproduce sexually, but at some point after they spread around the globe, some females evolved the ability to clone themselves through parthenogenesis. To layer on the horror aspect: females molt before ovulation, and they are cannibals. They have 2 tricks to survive in harsh environments. They expel the excess salt through their gills (they live in saltier water than is comfortable to avoid predators), and they share the tardigrade's sugar protein that acts like a scaffold to support cell-structure during dehydration. This ability to survive dehydration seems to be the secret to surviving extreme temperatures and cosmic rays, since most cellular damage comes from the water (again, survival doesn't mean they are indestructible, it means a small percentage of the experiment survived). No foreseen difference in anatomy, in my opinion. It is rather biochemistry which matters. Think of brine shrimps. Another example is the bacteria and algae of the Dead sea. Dead-sea biota is an example of a microorganism-based ecosystem. Brine shrimps feed mainly on plankton but are opportunistic enough to eat debris from non-brine ecosystem. In the deep, where no sunlight is present for photosynthesis, this opportunistic scavenging of debris from "above" the brine pool becomes more important. For anaerobic multicellular organisms, check this. Not the answer you're looking for? Browse other questions tagged biology environment xenobiology sea-creatures or ask your own question. What volcanic gases & factors, isolated in pockets/caves under an oceanic crust, could create odd ecosystems and new extremophiles? Do we need to match and couple humans manually in future to maintain gene pool of human beings? World Map - How can I tell if the Ecosystems are realistic?